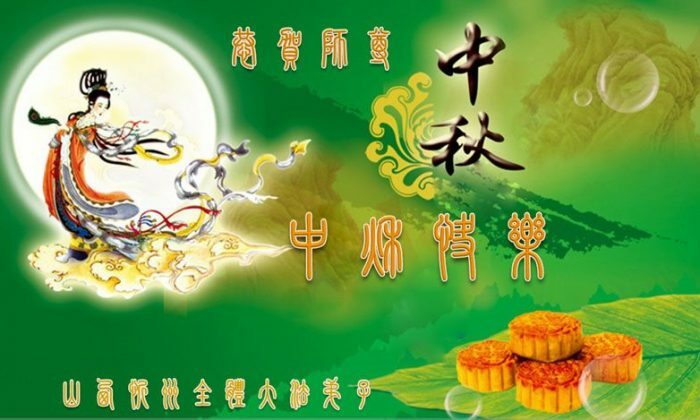 Poems, personal messages, and colored cards are pouring into a Falun Gong website as thousands express their greetings and goodwill to Mr. Li Hongzhi, the founder of the Chinese spiritual practice, on the occasion of the Mid-Autumn Festival. Falling on Sept. 15 this year, the holiday that dates back well over a thousand years has seen both practitioners of Falun Gong, as well as those who do not practice, sending their regards via Minghui.org, a U.S.-based website that was founded in 1999. Mr. Li first taught Falun Gong in northeastern China in 1992. The meditation practice, which teaches practitioners self-improvement along the principles of truthfulness, compassion, and tolerance, rapidly gained in popularity, but was banned in 1999 by the Communist Party. In 1999 a state report estimated 70 million mainland Chinese had taken up the practice. Though Falun Gong, also known as Falun Dafa, remains persecuted in China to this day, this has not stopped people in scores of nations worldwide from practicing Falun Gong, nor has it silenced the voices of practitioners still in mainland China. Also known as the Moon Festival, the Chinese holiday has a history going back to the Tang Dynasty, where people get together with families and friends to enjoy colored lanterns and eat mooncakes. The predominant theme of the greetings was gratitude and longing. Some said they wished that they could join Mr. Li, who resides in the United States, in celebrating the Mid-Autumn Festival. Practitioners from Mr. Li’s hometown of Changchun in northeast China recalled the days when Mr. Li first taught the practice in China and hoped for his eventual return. Others related personal experiences and breakthroughs in their practice of Falun Gong. A family of six from Heilongjiang not only wished Mr. Li a happy holiday, but also declared their strong will to stay in the practice, even though two of them had been made homeless because of the persecution. Some Chinese who do not practice Falun Gong have also written to convey their respects. The greetings also included poems and electronic colored cards, and came from multiple provinces and people from many backgrounds, including those in the oil, health, mining, security, education, finance and railroad industries. Cards and well-wishes are not limited to those living inside China. At the time of writing, Minghui.org has received holiday greetings to Mr. Li from practitioners from England, France, Ireland, Germany, Denmark, Italy, Finland, Australia, New Zealand, Thailand, Iran, Turkey, United Arab Emirates, Canada, and the United States. In 2008 the U.S. Department of State cited estimates that Falun Gong practitioners were as many as half of the Chinese regime’s reform-through-labor population, a number that would be in the hundreds of thousands. Human rights groups have reported that practitioners often receive the worst abuse in detention. Practitioners have reported being subjected to torture, beating, sleep deprivation, forced labor and many other forms of abuses. Minghui.org has confirmed that 4,030 practitioners have died from torture and abuse since 1999, although with the difficulty of getting information out of China this number is believed to be low. The total number of deaths could be over a million, based on developing investigations into the communist regime’s practice of forced organ harvesting. Researchers believe detained Falun Gong practitioners are the primary source for organs used in China’s transplantation industry. Outside of China, the practice has been taken up by people from at least 78 countries and regions around the world. In May of this year, nearly 10,000 practitioners from at least 53 nations participated in a Falun Gong experience sharing conference at Barclays Center in Brooklyn.